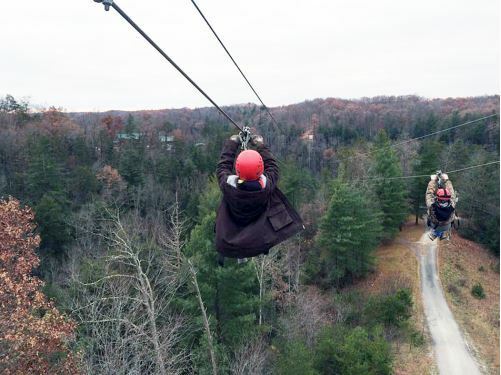 Troop 33 Scouts descend at high speed on a zip line while on an adventure trip in Kentucky. 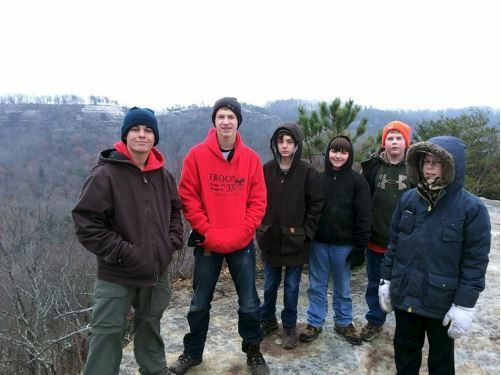 Boy Scouts from DeKalb’s Troop 33 traveled to Kentucky to experience a four-part series of adventures packed into the Thanksgiving holiday. At Daniel Boone National Forest, they backpacked through rugged mountains, along steep wooded ridges, narrow ravines, rock formations, and sandstone cliffs. One of their favorite places was atop Double Arch rock, which provided an amazing view of the surrounding wilderness. Later that day, they did what millions of Americans were doing. A Thanksgiving meal, which they cooked themselves, was complete with ham, mashed potatoes, gravy, stuffing, green beans and dinner rolls. Rock climbing in the Red River Gorge included safety instruction and the excitement of climbing and rappelling. Training included first aid and emergencies, special knots, climbing equipment, technical skills, verbal signals and safety procedures. Then everything they learned became an action, as Scouts went straight up the rugged rock face of high cliffs and rappelled back down. Next was “via ferrata”, Italian for “iron road.” It’s a climbing route built across a treacherous rock face using iron rungs, pegs, carved steps, ladders and narrow swinging bridges. Harnessed and clipped to a safety cable, Scouts undertook the extreme challenge of traversing the via ferrata routes. Via ferrata was used in Europe during World War I by the Italians to move troops through the otherwise impassable Dolomite Mountains. Next and last was a visit to one of the nation’s largest zip line centers. A zip line consists of a pulley mounted to a cable that slides down from a high point to a lower point. Scouts used a safety harness to ride down a cable at each of seven zip lines, including some of the fastest, highest and longest in the nation. It was a Thanksgiving holiday they will never forget. 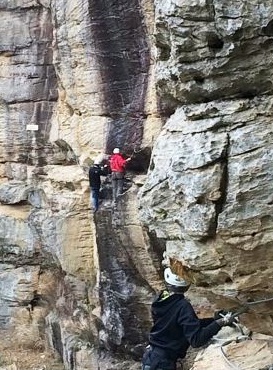 Troop 33 Scouts climbed the via ferrata on the vertical rock face of a canyon while on an adventure trip in Kentucky. Scouts stand atop the Double Arch rock formation while backpacking at Daniel Boone National Forest in Kentucky. From left, Keegan Donnelly, Jordan Burke, Ryan McNett, Jack Petrie, Noah Larsen, Seth Wickens-Walther.